HARMLESS THOUGHTS: My New Favorite Sandwich! My new favorite thing to eat... Peanut Butter / Biscoff sandwiches! I first tried this with a product called Speculoos Cookie Butter . My wife bought a jar of it at Trader Joe's. Since she hadn't been back, I've been doing without... until I found the original at Wal-Mart! 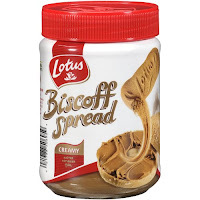 It is called Lotus Biscoff Spread. I am sure it is not all that healthy. It is made from cookies, but it has no nuts in it (for those with allergies).